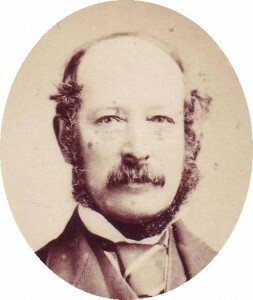 Henry was born in Honiton, Devon on 21 December 1822. His father, George, had been born in Lambeth, where, at one time he owned a large tannery, according to a note by his granddaughter Catherine. George’s occupation is recorded as Cordwainer on Henry’s baptismal certificate. In the 1841 census George’s occupation is Comedian and he is staying at the Pheasant Inn, King Street, Hurst, Berkshire, with Catherine Powell, age 42 (Vocalist) and son, Henry, age 19 (Professor of Music). George died in Alton on 9 June 1842, his occupation still recorded as Comedian. Henry travelled around Russia as a young man, mixing in musical circles. 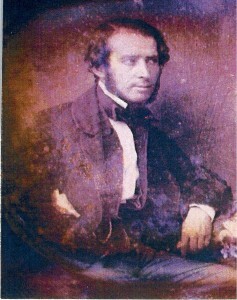 This daguerreotype of him was taken in St Petersburg to mark his 21st birthday on 21 December 1843. There is a family legend (with some circumstantial evidence that may back it up) that during his travels in Russia Henry had a love affair which produced an illegitimate daughter. There is talk of a link to the heart of the Rimsky-Korsakov family. This interesting possibility is the subject of current research. 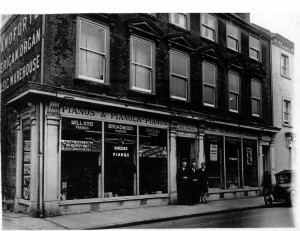 I do not know what brought Henry to Basingstoke but by 1858 he had started a music business in Winchester Street, moving later to premises in London Street, where he was recorded in the 1861 census. As well as teaching music, Henry provided musicians for concerts and various events. An 1858 invoice shows that he supplied musicians for a concert to celebrate the marriage of The Princess Royal. It seems that Henry was called as a witness in the Victorian trial for perjury of Sir Roger C D Tichborne, bart: the famous “Tichborne Trial”, which had Hampshire connections. On the fifth day of the proceedings, 28 April 1873, there is a reference in the trial transcript to: “Mr H M Powell – teacher of music” having given lessons on the French horn to Sir Roger Tichborne. 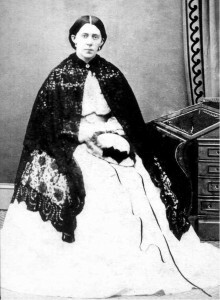 Henry married Sarah May from Odiham on 25 September 1856. They had seven children. Notes on five of them and six of their grandchildren follow. He died on 24 October 1882. Catherine was born 16 August 1859. On 21 September 1881 Catherine Powell is listed as being present at the banquet in Basingstoke’s Corn Exchange which celebrated the release of the ten “Massagainian Martyrs” from Winchester prison after their riots against the Salvation Army. In 1881 she married Edward Adams of the brewing family, who figured prominently in these riots, and who later became Mayor in 1889. She was a minor author whose very first story was accepted by Alfred Harmsworth, the newspaper and publishing magnate, who wrote an encouraging letter to her, praising the work. 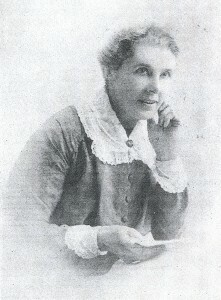 Catherine wrote The Separation of The Beresfords and Other Tales which first appeared in the February 1899 edition of Harmsworth Magazine. Stories and articles also appeared in the pages of The Sketch, The Grand, The Royal and other publications. 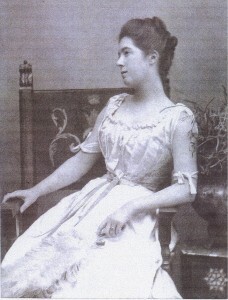 Catherine supplied libretti for some light operettas, including The Girton Girl and the Milkmaid (republished in America as The College Girl and the Milkmaid) by the English composer Alfred J Caldicott (1842-1897). She may also have been the author of A Revolt in the Library, or, the Best Book (SPCK 1898). Two of her operettas were performed at the Drill Hall in Basingstoke, in 1893, seemingly before their official publication. 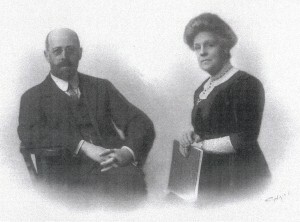 After Edward’s death on 27 April 1919, and after her four children had left home, Catherine sold Devonshire Lodge, the family home in Winchester Road, and went to live in Sri Lanka, or Ceylon as it was then known, where two of her sons were working in the tea business. This was in or about 1923. Here she continued to write stories and articles for The Ceylon Causerie and other local journals. Catherine died in Sri Lanka on 17 November 1934 and is buried at Badulla. Catherine and Edward’s daughter was born on 25 February 1885. In early life she was a chaperone, mixing in fairly high circles. On 21 April 1931 she married Llewellyn Chisholm Dalton, a British colonial judge and author, who received a knighthood two years after his appointment as Lord Chief Justice of Tanganyika. After the death of her husband in 1949, Winifred was offered a Grace and Favour apartment in Hampton Court Palace. She was very proud of this offer, although, in the event, she did not take it up! In later life Lady Dalton lived at Stanhope Court Hotel, off the Gloucester Road, in Kensington. She was very friendly with fellow resident, Mrs Rattigan, the mother of playwright, Terence Rattigan, who based his play Separate Tables on the hotel and its world of well-to-do loneliness. Maureen Morgan, a grand-niece of Winifred Dalton, who remembers her well, is certain that she was the model for the character, Mrs Railton-Bell. Winifred was a friend of the Chief Scout, Robert Baden-Powell and his wife, Olave. Olave stayed with the Daltons when they lived in Tanganyika. Lady Dalton is buried in Worting Road Cemetery. Blanche, born 25 December 1862, was a singer, known professionally as Madame Blanche Powell ARAM. It is said that she sang into the first phonograph in England. She married Frank Griffiths Hollis, a gifted young musician from Northampton. In 1899 Frank Hollis set to music some lyrics written by Blanche’s sister, Catherine. 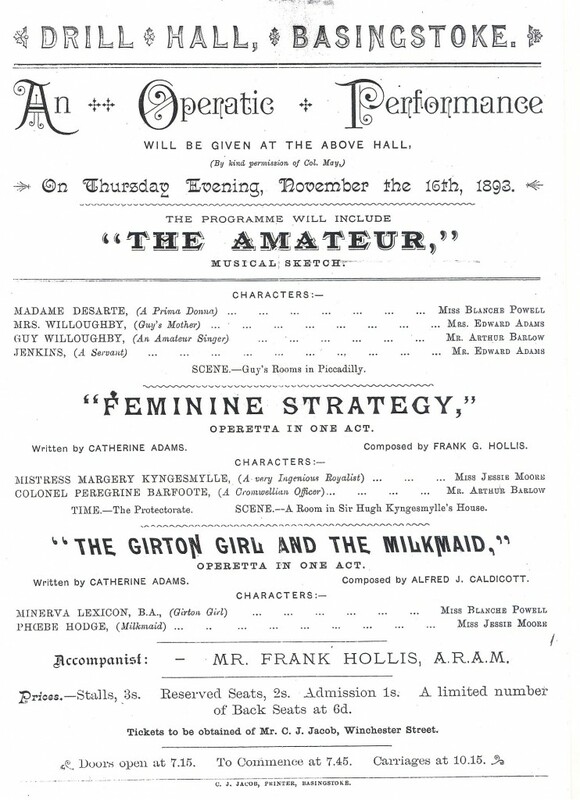 The work, entitled Feminine Strategy: a Musical Dialogue, was performed as part of an operatic evening in the Drill Hall, Sarum Hill, on 16 November, 1893, together with The Girton Girl and the Milkmaid (see above). Frank, a pianist and organist, frequently gave public performances with Blanche. They lived at 154 Elgin Avenue, Maida Vale, where Frank died, tragically, in 1896, aged 28. Blanche died in June 1938. Arthur was born on 21 February 1864. In 1882 he was a Second Mate in the Merchant Service and later became a naval tailor in the City of London. His business partner absconded with funds. Arthur died 13 March 1942. Harry Powell was born on 30 October 1865. He was conductor of the Basingstoke Choral Society and for about twenty years was organist at St Mary’s Church, Basing. In his Will, his father, Henry Mills Powell, had left the London Street premises in trust to his children. The trustees were his brother, Edmund Powell (of Liverpool, a Master in the Merchant Service) and John May (his brother-in-law from Odiham, not Colonel John May of Basingstoke). Harry eventually bought out his siblings’ interests. Edward Adams, a Trustee appointed in Edmund Powell’s Will, seems to have temporarily owned the adjoining premises on the west, which had been a druggist’s shop, and sold it to Harry in 1892. 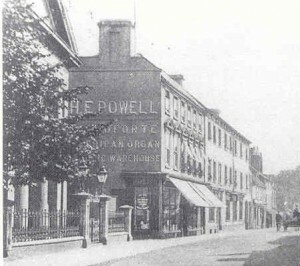 The premises at 20/22 London Street now ran up to the corner of May Place. A large room above his shop was used for rehearsals, concerts and dances. Harry Powell gave music lessons to the young Princess Marie-Jose and her brother Prince Charles when the Belgian royal family came to live at Hackwood House at the invitation of Lord Curzon. Harry used to tell the story that the little Princess, later to be the last Queen of Italy, put some glue on his chair one day as a prank. Harry also had built a large detached house: 26, Cliddesden Road. The house, then called “Stalheim”, is now The Tudor Lodge. Harry married Alice Katherine Allen and they had four daughters and a son. Harry died on 11 April 1917. Daughter, Marion, was a cellist. We know this from a Basingstoke Choral Society programme dated 10 February 1903. Interestingly, her aunt, Blanche, sang at this concert, which her father, Harry, conducted. Another of Harry Powell’s daughters, Margery, was a violinist but I do not know if this was in a professional capacity. However, I do know that her son, Michael Hobson, played in an orchestra which visited Basingstoke in 1952. Harry Powell’s only son, Henry Stewart Powell, served in the Royal Flying Corps during WW1, having transferred from the Ceylon Planters’ Rifle Corps in 1915. He was awarded the Military Cross in 1917, whilst a Temporary Captain. In 1931 he became a Wing Commander in the RAF. He died on 1 February 1939 and his funeral service was held at St Michael’s, Basingstoke. After the death of his wife, Céline, Gerald married Blanche Moody, the eldest daughter of James Moody, my great grandfather, who ran the furniture business at 17 London Street, which was nearly opposite the Powell Music shop. Nancy was the only child of Gerald and Blanche. Born in Lille in 1906, she was brought up in Nogent-le-Rotrou. Twice she had to leave France, following German invasions. During the First World War she spent over two years in Basingstoke, attending the High School. The story of her 1940 escape from occupied France with her parents, Gerald and Blanche, is told in this section of the website, together with extensive correspondence from French friends, written during and after the war. In 2001 Barbara and Bob Applin retraced the family’s escape journey and the account of their trip is also on the website. After the Second World War Nancy lived for many years at 17 Frances Road, Basingstoke. 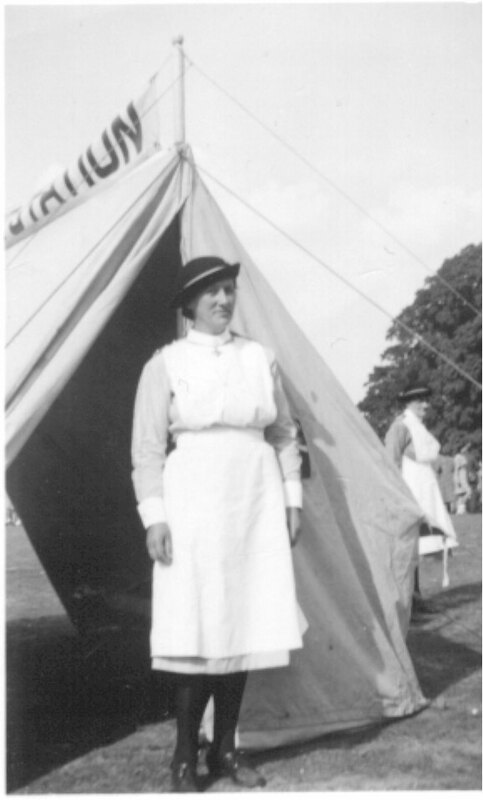 Nancy served in the St John Ambulance and for 30 years was Divisional Superintendent of the Nursing Division. In 1969 she was made a Serving Sister in the Order of St John. She also worked for 15 years as a medical secretary at Park Prewett Hospital. Nancy died in Basingstoke in 1996. I would like to thank Maureen Morgan (great great granddaughter of Henry Mills Powell) for information about her family and for family photographs. I am also grateful to Bob Clarke for additional information about Catherine Powell, and for facts gleaned from his recently published book: The Basingstoke Riots. Thanks also to cousin Bob Deane for copies of the death certificate of George Powell and Henry Mills Powell’s marriage certificate. Thanks to Ian Williams and Peter Stone for military information. 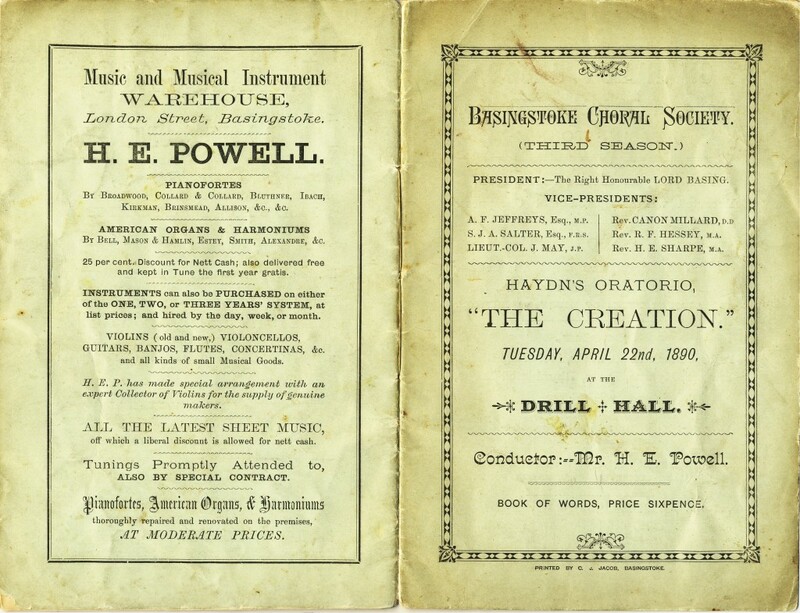 I am also grateful to the Basingstoke Discovery Centre, for permission to reproduce the Drill Hall playbill. And a most sincere thank you to Barbara Applin for her helpful advice and assistance, and for the photographs of 20/22 London Road and Nancy Powell.